Music video for "To Make You Feel My Love." If this does not work, watch it on My Play Direct. © 1997 Sony Music Entertainment. Watch more videos on BillyJoel.com, Sony MyPlay or Vevo YouTube channel. Download "To Make You Feel My Love"
Billy recorded three covers of songs to include on Greatest Hits III, including a cover of a previously unreleased Bob Dylan song "To Make You Feel My Love." Dylan had not even recorded it yet (Dylan's version came out a few years later). Billy does the song ample justice. The song is a raw, meaty, pained dirge about the lengths one will go through to show their love. The imagery of crawling down the avenue, storms raging, and going "black and blue" for love are very powerful. In addition to this imagery, the organ in the background and the harmonica and organ bridge give the song its emotional balance and weight. The Rascals' Felix Caviliere plays the organ on the album and video. And the rolling snare drum propels the song forward. 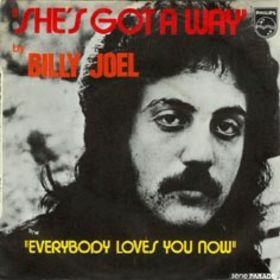 The song has been covered by several other artists including Dylan himself (Garth Brooks, Adele, Trisha Yearwood), but Billy's version is the most raw and urgent, befitting the theme of the song. He owns it. The official music video (a live performance) was sometimes hard to find online, but is now on YouTube and can also be found on the video for Greatest Hits III and the Essential Video Collection too. Billy performs "To Make You Feel My Love" on Late Night with David Letterman. Felix Cavaliere of The Rascals is on the organ. The talented Mark Rivera, who usually plays sax, is on the harmonica. Go to the Greatest Hits III main page to see the full interview.